What: Poetry Reading, light refreshments, door prizes! Today I am proud to be playing a part in the fight against Parkinson’s disease. As Team Fox members, we will be hosting the 4th annual Poets for Parkinson’s fundraiser. And we’ll be asking friends and family for support. Taking on the challenge of this fundraising endeavor is both exciting and inspiring. I am making a commitment to raise funds and awareness for Parkinson’s disease (PD). I am dedicating my efforts to The Michael J. Fox Foundation because I believe that I am helping to ultimately shorten the road to a cure. 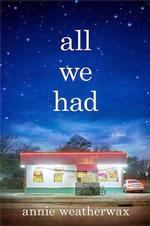 All We Had tells the story of the hardscrabble life of thirteen-year-old Ruthie and her mother, Rita. Ruthie and Rita have never had a stable life, but after many ups and down they have carved out a space for themselves the small town of Fat River. But even as Ruthie hopes that their life has finally gotten back on track, it takes another frightening turn. All We Had has been praised as a “strong, quiet and powerful look at the human heart,” by Kate Alcott. Join us for an evening of beautiful poetry, fine art, and good eats at the 3rd Annual Poets for Parkinson’s. http://fundraise.michaeljfox.org/poetsTo reserve your seat simply CLICK HERE and make a $25, or more, donation per person. Your name will be added to our guest list. 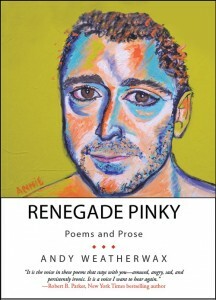 Poet Andy Weatherwax reads from the anthology Daring to Repair at a Wising Up Press reading at The Center for the Arts at the Armory in Somerville, MA. Daring to Repair: What is It, Who Does It & Why? I have four poems in this anthology published by Universal Table/Wising Up Press, a wonderful organization run by two very enthusiastic and passionate people: Heather Tosteson and Charles Brockett. We had a reading at the Center for the Arts at the Armory in Somerville MA in the spring of 2012. What is repair in relationships? It’s not starting anew. It’s not jumping ship. It’s not settling, either. It takes as many forms as there are relationships. It’s difficult. It matters. It takes both sides to do it-and we do it all the time, in large and small ways. So why don’t we like to talk about it? Why do we tend to think of it as a failure rather than a source of resilience, like the constant re-equilibrations of balance that allow us to walk, dance, break bread and move mountains? 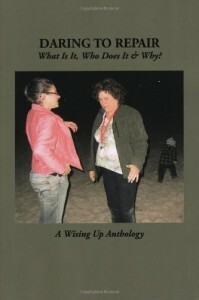 In this intriguing anthology of poetry, memoir, and story, forty-four talented writers ages twenty to eighty explore repair in many forms: between adults and their parents, parents and their children, in romantic relationships, marriage, divorce, bereavement because of the death of a parent, spouse, or grandchild, and in relationship to broader social conditions as well, like poverty, addiction, racism, war, physical differences, disease. With humor, grief, wit, tenderness, honesty, kindness, anger and hope, they invite us to explore-and celebrate-what it takes for all of us to stay connected. This is a book you can find yourself in. This is a book you can share-with a brother, a long lost friend or one you talk with daily, a parent, a child, a colleague, a spouse-and learn something new about them and yourself, growing closer in the process. Contributors: Patricia Barone, Bari Benjamin, Wendy Brown-Báez, Caitlin Buckley, Rose Burke, Susan Kay Chernilo, Arhm Choi, Marian Mathews Clark, Willy Conley, Terry Cox-Joseph, Bill Denham, Martha Gies, Judith Goedeke, Janet Lunder Hanafin, R.E. Hayes, William Henderson, Paul Hostovsky, Beth Lefebvre, Russ Allison Loar, Michele Markarian, Diane Mierzwik, Caridad Moro, Tim Myers, Wendy Jones Nakanishi, Eve Mills Allen, Sophia J. Nolan, Jim Pahz, Rachel Raimondi, Melanie Reitzel, Lori Rottenberg, Mary Kay Rummel, Adrienne Ross Scanlan, Evelyn Sharenov, Isabelle Bruder Smith, Thomas J. Stevenson, Elizabeth Swann, Elaine J. Taber, Don Thackrey, Heather Tosteson, Carol Tufts, Georgann Turner, Marta Tveit, Andy Weatherwax, Mary Wheeler, Weihua Zhang.